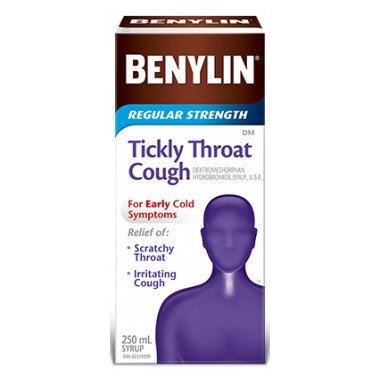 Benylin Tickly Throat Cough Syrup is specifically formulated for your early cold symptoms. Its formula soothes your throat while its cough suppressant relieves coughs from minor throat irritation. Artificial sweetener enhancer, citric acid, D & C Red No. 33, FD & C Red No. 40, flavour, glycerin, menthol, polyethylene glycol, sodium benzoate, sodium carboxymethylcellulose, sodium citrate, sodium cyclamate, sorbitol, water. 2 tsp. (10 mL) every 6-8 hours. Maximum 8 tsp. (40 mL)/day. Warning: Talk to a doctor before using this product if you have asthma, chronic lung disease/shortness of breath, persistent/chronic cough, or are pregnant, breastfeeding, or taking a drug for depression, including monoamine oxidase inhibitor (MAOI) drugs. Check with a doctor if cough worsens, lasts more than 7 days, or tends to recur or if you also have excessive secretions or fever. Do not take more than the recommended dosage.